Have you ever been driving in the winter and see white roads, thinking it was snow, only to find that it was actually salt dissolved and caked onto the pavement (like the above picture)? Salt is ever-present during Connecticut winters, helping to protect anyone behind the wheel from icy roads. Unfortunately, come spring this salt will end up, without exception, in our fresh water bodies like the Housatonic River and our beloved Candlewood lake, making them saltier. Salt is particularly good at staying in water, changing the chemical composition of that water for years. Once the salt gets into our fresh water, it can have adverse effects on the quality of the lake’s ecosystem, hurting fish populations, and preventing growth of important native plants that provide food for all sorts of organisms in the water. Despite this, there is no question that we need salt in the winter to help keep us safe on the road, so what can we do? Thankfully, this is something that all of us can help tackle together by taking small steps in our daily routines this winter. 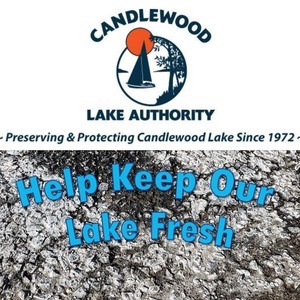 The CLA is hopes to work with municipalities and private contractors across the Candlewood Lake Watershed to help improve road salt application, but as residents, we can help make a difference too! We learned from the Minnesota Pollution Control Agency that one coffee mug full of salt is enough to de-ice a 20ft driveway, or ten sidewalk squares! It can be easy to use too much salt, which has a diminishing return as you use more, costs you more money, and ends up in our lake. Too much salt can hurt the sensitive pads on pets’ paws too, so when you walk your dog in the winter, it can be a good idea for them to wear little booties to help protect their feet. By minimizing salt use, you’re helping the environment, your wallet, and your neighborhood pets. In fact, it only takes one teaspoon of salt to permanently pollute five gallons of water. That means, for every pound of salt you save, you are protecting 400 gallons of water! That’s about the same amount as 4 bathtubs! You can also sweep up and reuse salt that remains on your driveway or walkways, since it can be used multiple times with the same ice-melting effect. Shovel as much as you can. Often, shoveling during and after a snow storm is the best way to prevent ice from forming on your driveway and sidewalks. Remember: one heaping coffee mug is enough salt to de-ice a 20ft driveway! After the ice has melted, sweep up the remaining salt crystals, and re-use them next time. Normal rock salt only works when the pavement is above 15℉, so if it’s too cold, use sand to increase traction, or choose a different deicer that works in lower temperatures. Salt doesn’t need to be dense to work. Spreading it out helps cover your pavement more effectively. Mixing it with some sand can help increase traction – just remember to sweep up the mixture to reuse! Our friends at the Minnesota Pollution Control Agency have a ton of information on how we can work together to “stop over-salting!” You can learn more at their website: http://stopoversalting.org/. Thank you so much for helping us protect Candlewood Lake from all types of pollution, and we at the CLA wish you a happy, safe, and low sodium winter!